In order to view analysis for tests you have taken here at Driving Theory Test Questions, you need to be a premium member of the site. We'll give you lots of useful information about your test performance to help prepare you for your test. We'll let you know how long you took on the test so you can see if you are answering questions in the necessary time, and of course your score. We'll tell you the pass mark for the test and what percentage you scored, and whether that mark amounts to a pass or fail. In addition, we'll give you a question by question breakdown of your performance, together with which questions formed the test. 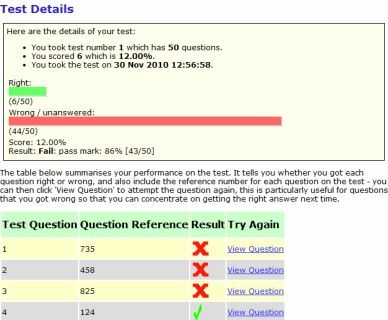 You can even click right through to try a question again that you got wrong, offering the most focused possible preparation for the theory test.